Danish manufacturer Republic of Fritz Hansen have produced this rather delightful review magazine of their releases this year at the Stockholm Furniture and Light Fair. 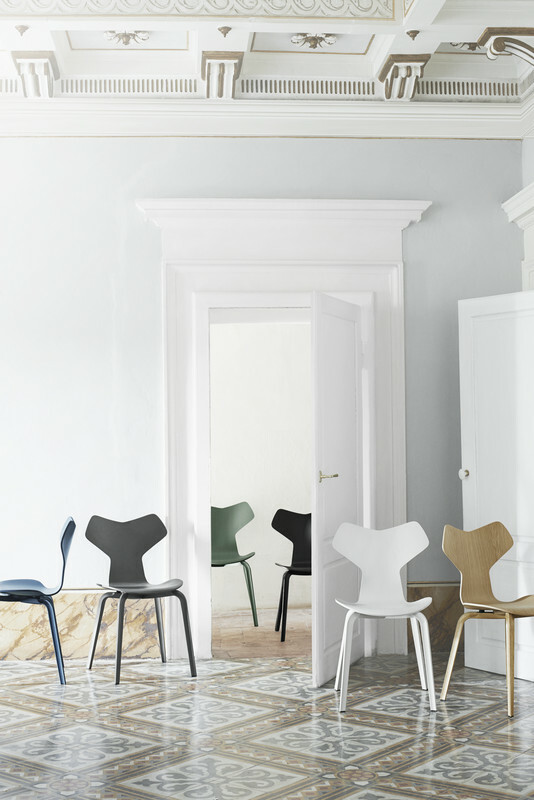 This year they pay homage to the classics, the relaunches and the novelties, including the re-introduction of Arne Jacobsen’s Pot Chair. From tomorrow the repeal of section 52 of the Copyright, Designs and Patent Act 1988 means that furniture designs in Britain are protected from unlicensed manufacture for 70 years, up from 25 years. Classic designs such as Mies van der Rohe’s Barcelona by Knoll, Arne Jacobsen’s Egg Chair by Fritz Hansen and the Eames Lounge chair by Vitra are once again fully copyrighted. Retailers selling unlicensed copies will be liable to fines up to £50,000 and jail terms of up to 10 years. A quick google search reveals quite a lot of vehement hostility aimed at the new law and its promoters, with some branding the likes of Vitra, Knoll and Herman Miller as ‘thieves’. Many of the naysayers are members of the general public who wish to furnish their homes cheaply and care little for the manufacturing provenance of the product or its future value. They complain that it shouldn’t cost for example £4500 for a lounge chair or over £1000 for a dining set for your home. Whilst this may be true the problem is less about individuals (although this all adds up) but well known national and multi-national brands who are buying fakes en masse for roll-outs in offices, cafeterias and restaurants. Even well known supermarkets have got in on the act with special promotions. Of course, many of these commentators display a complete ignorance of the design, research and development process and its costs and seem to think that tooling never needs to be replaced. Nor do they acknowledge the cost of promotion without which these classics would be unknown failures and there would be no market for the replica manufacturers. They also fail to acknowledge the continual development that genuine manufacturers put into these products as well as investment in R&D for future products. For example, Verner Panton’s ‘Panton’ chair by Vitra has only fairly recently been sold as originally intended due to material limitations, the Bertoia Side chair by Knoll Studio is now available with a much more cost conscious plastic shell and the Eames Lounge Chair itself was improved upon after release, not being fully realised until the mid-60s. An oft touted defence of replicas is that the Eameses stood for accessible and affordable design for the masses. However, the replica market is largely filled with poor quality products made with cheap Far-East labour in factories with dubious environmental credentials. Was that really what Charles and Ray Eames stood for? It’s also well known (but conveniently ignored by many) that Charles and Ray Eames themselves fought against fakes, even going so far as to create a ‘Beware of Imitations’ advertisement for Herman Miller in 1962. 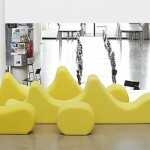 Recent furniture innovations: Joyn benching and Alcove sofas by Vitra kickstarted the agile working revolution. Continuous development: the Aeron by Herman Miller now released as a Remastered version and the Bertoia Side Chair by KnollStudio now available as a plastic shell. Is it time for 21st Century Classics? Herman Miller can hardly be accused of resting on their laurels, especially in the task seating market with innovations and developments such as the Aeron (a new revised Aeron Remastered has recently been launched that utilises up to date materials and mechanisms), Mirra, Embody, Sayl, and Keyn chairs. Vitra also continue to sponsor new designs and designers, with innovations such as the Alcove sofa and Joyn bench by Ronan & Erwan Bouroullec, two products that have been massively influential in the changing work patterns of the early 21st century office environment. The key here though is the focus on innovations in the office environment. New – and more importantly affordable – design in crossover lounge and dining furniture that may be used in the office or the home seems less prevalent. We love mid-century design but it’s too often used as a default, redefined or copied. Has this led to design stagnation? Certainly, there is still innovation in the furniture industry but new designs are often overlooked by architects and interior designers in favour of the safe option. There are already many good modern designs and designers out there but it’s difficult to get new designs recognised when the market is flooded with cheap copies of classics. Why should the fakers circumvent the processes of design, research & development, prototyping and promotion? With the new legislation comes new challenges. Whilst some of these companies will seek to find loopholes to circumvent the new legislation (we have heard of one company importing to Ireland where fakes are not illegal and then 3rd party freight forwarding to the UK) it would be hoped that others will choose to focus on new products and to employ the next generation of designers to create their own design classics. This is certainly a challenge, but not one without rewards for the bold. Specifiers, architects and designers must also play their part and seek beyond the obvious. Part of this is through education and here companies like ourselves must be pro-active in engaging with the design community to impart a broader product knowledge. Finally, the responsibility also lies with the consumer. Just like more and more people inform themselves of the ethics of what they eat or what car they buy, they should also think about how they furnish their homes. We’ll end this article with an unashamedly mid-century quotation from Charles Eames himself, taken from Herman Miller’s Design Q+A. Q: What designs would tend toward ephemeral or towards permanence? It’s Easter weekend so we’re being obvious and celebrating the famous Fritz Hansen Egg Chair. The iconic Egg Chair was designed by Arne Jacobsen who died on this day in 1971. Now in it’s 58th year, it’s a classic design that doesn’t get tired. 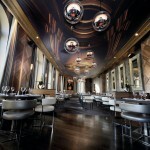 Jacobsen originally designed the chair for the Royal Hotel in Copenhagen. Over the years it’s been produced in many fabrics and leathers including some special editions. Here’s a few we like but, to borrow from the famous chocolate egg advertising campaign, how do you eat yours? You may remember our feature on the continuing appeal of Danish designer Arne Jacobsen last year. Of course Jacobsen had a long association with Fritz Hansen producing a series of classic chairs. The Drop chair was designed by Arne Jacobsen back in 1958 as part of his masterpiece, the legendary Radisson Blu Royal Hotel in Copenhagen. The Drop was originally produced along with the Swan and the Egg but only in a very limited number exclusively for the hotel. After more than 50 years in hibernation, the Drop is now relaunched. 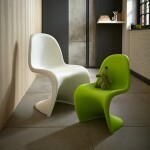 It is a small chair with a big personality and it is as fresh and vibrant as a new design but with a rare heritage. 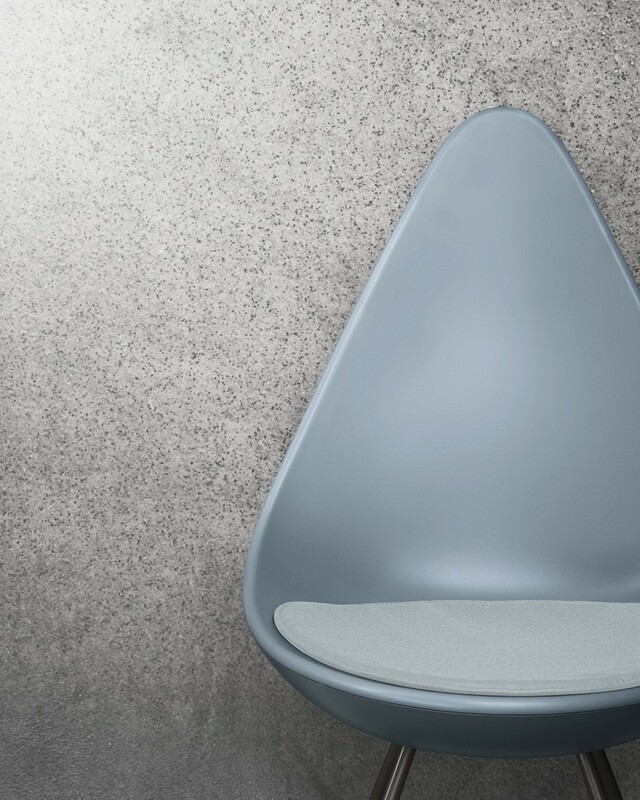 Available as a plastic shell or fully upholstered, the water droplet design of the back combines a warm embrace with freedom of movement, resulting in a surprising level of comfort. Verner Panton (1926-1998) was one of the true rebels and pioneers of mid-20th century design. Born in Denmark, he studied at the Royal Danish Academy of Art in Copenhagen. After serving his apprenticeship with Arne Jacobsen, Panton set out on a two-year furniture design odyssey across Europe in a VW camper van equipped with a drawing office! Establishing contacts with many furniture manufacturers Panton’s first production design was the Bachelor chair produced by Fritz Hansen in 1965. Many other innovative and futuristic designs followed including the Cone Chair, Living Tower and the S-chair product line from which developed the famous Vitra Panton Chair. 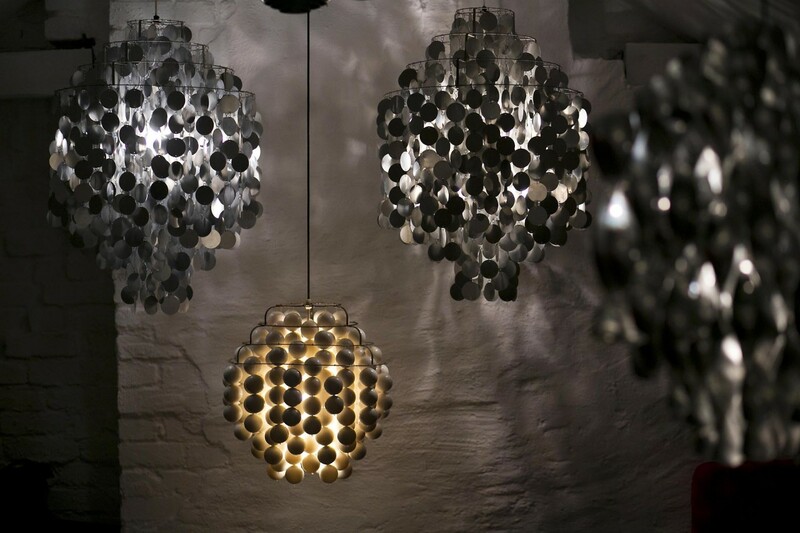 As well as furniture, Panton created a series of textiles (many still manufactured) and a series of modern lamps. Panton was interested not only in the lighting itself but in how it should interact with and influence its surroundings. 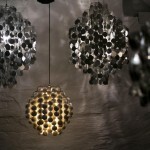 His lighting designs often include multiple reflective or metallic surfaces. Fun (1964), is an almost ‘bling’ design featuring small metal or mother of pearl articulated disks that sparkle and throw reflected light wonderfully around the room. 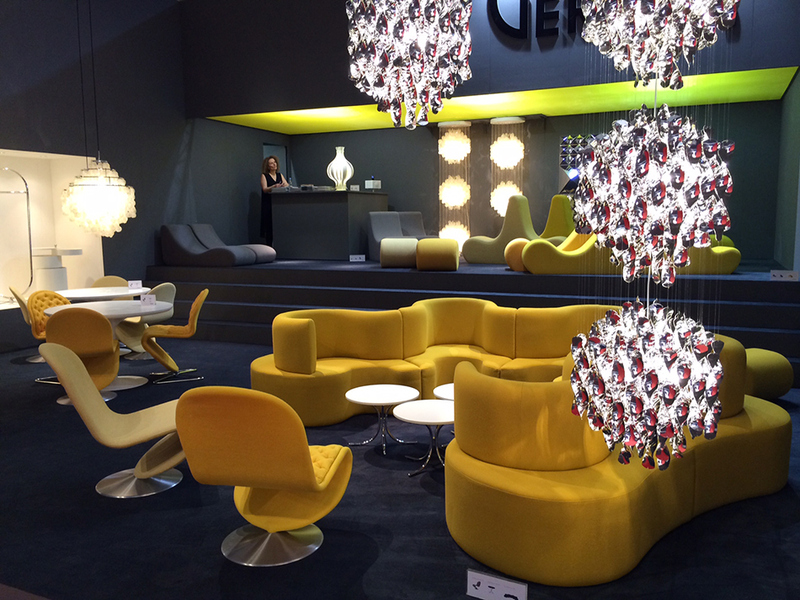 Danish company Verpan has for many years continued the appeal of the works of Verner Panton. Beginning with Panton’s lamps they have now recently introduced a new collection of furniture and rugs from the Verner Panton archives. 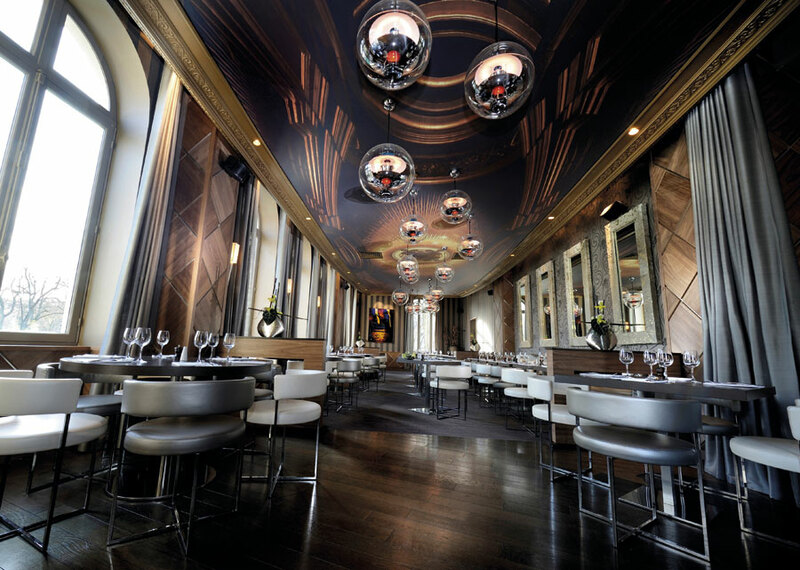 From the System 1-2-3 to Panto Pop and the Cloverleaf, the often sinuous and fluid designs have a sense of fun, brought to life by Verpan with a degree of opulence. It’s testament to the timelessness of the original designs that there is still great interest in these designs 40 or more years on. Verner Panton was an inspirational and colourful personality. A unique person with a special sense of colours, shapes, light function and room. Ever since its launch in 2005, the Little Friend table has found itself a home with design conscious customers around the world, as the perfect partner for anything from a laptop to a café latte. 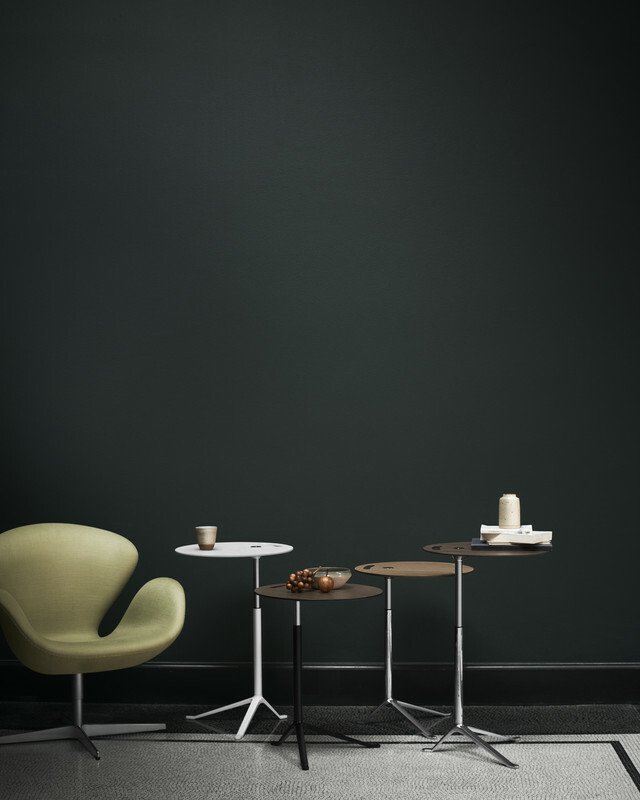 Fritz Hansen have now introduced the table top in veneer – in addition to the variety of laminate colours. Now available in either oak or walnut veneer, customers can place this portable table from room to room and from home to office, as a minimalistic solution to modern living and working. Also re-introduced in it’s original wooden leg design is the Grand Prix chair. Designed by Arne Jacobsen and originally known as the Model 3130, the chair was renamed after it won the Grand Prix at the XI. Triennale di Milano in 1957. The Grand Prix was produced with wooden legs however, these were later replaced by the metal undercarriage used on the 3107s. Thanks to new production methods the Grand Prix Chair is now available in the original design in 9 colours and 2 veneer finishes. Despite the affordable price, the chair remains exclusive and will blend elegantly into a wide variety of settings as a great example of furniture design that is able to influence and elevate an entire room by its mere presence and beauty.